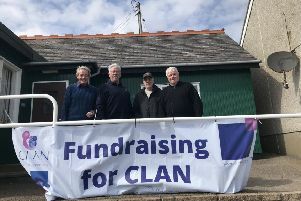 The new season has been slightly hampered with recent rainfalls although a few hardy souls took to the course last Saturday to contest the Malcolm Sargent Cancer Care Medal. The CSS of 66 gave an indication of the difficulty however Nick Lang prevailed by virtue of a better inward half, carding a 64. Thomas Blanchard & John Cowling matched the 64 and a trio on 65 followed: Grant Robb, Christopher Irvine & Bruce Ferguson. Bruce carded the best gross score of 69 on the day. Next Saturday sees a change in format with the Tri-Am competition where teams of three battle it out armed with a calculator. With the return of (ahem) the summer weather, the clubhouse and catering hours are extended and freshly cooked meals and snacks are available.